Roffey captain Matt Davies is delighted his side took another step to retain the Gray-Nicolls T20 Cup after a five-wicket win over Preston Nomads saw them into the semi-finals. The Boars won the toss and elected to field and Nomads posted 107-8 off their 20 overs with captain Daniel Phillips (23) topscoring. In reply, Roffey picked off the target in 13.1 overs, hitting 113-5 thanks to good knocks from Ben Manenti (37) and Usman Khan (36). They have now been drawn away at Hastings in the last four clash on July 22. Davies was pleased with the performance after their heavy derby defeat to Horsham and has backed his team to lift the trophy again. Nomads started brightly as a quickfire 20 off 18 balls from Oliver Gatting and a good knock from Phillips. However, after the loss of Gatting and Phillips to Jamie Atkins (1-26) and George Fleming (2-21) none of the rest of the top order made double figures. The damage was done by Paul Harrison (4-14) as he swept through the Nomads top half. Some resistance was met in the form of Kashif Ibrahim (19*) but the Roffey regularly took wickets and contained the run-rate. The Boars lost captain Davies for a duck early in the innings but Manenti and Khan got things back on track before they fell to Blair Tickner (1-18) and Adam O’Brien (1-35). Rohit Jagota (21) pushed Roffey closer to the target before Harrison (nine*) and Theo Rivers (nought*) saw the Boars home. 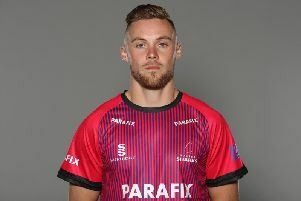 Davies added: “With the injuries we have in the bowling department, limited overs cricket is much better for us which is why we’re going well in the National and the T20. “Our bowling attack bowled very well and we fielded well, it was all round a good performance.